José Manuel Barroso has called for an end to austerity all across the European Union, reports Left Foot Forward’s Alex Hern. 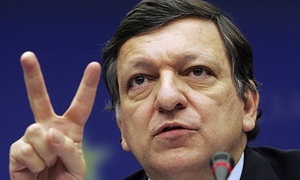 José Manuel Barroso, President of the European Commission, has become one of a growing chorus of voices calling for Osborne and Cameron to abandon their unwavering commitment to a program of austerity or ruin. “It is true that we do not have much room for a new fiscal stimulus. But that does not meant that we cannot do more to promote growth. “First, those who have fiscal space available must explore it – but in a sustainable way. The Union and its Member States should urgently consider how to allow their own policy-driven bank, the European Investment Bank to do more – and possibly much more – to finance long-term investment. To do so, we need to explore ways to reinforce the EIB’s resources and capital base so that it can lend to the real economy. If Osborne finally gives in and accepts that we must switch to a plan B, he will be moving from the doubtful company of pre-crash Ireland – no longer the shining example he once considered it – and following the advice of Legarde, Barroso, and Obama, whose speech calling for the Republicans to accept the Jobs Bill could be adapted with very little change and addressed at the Conservatives bringing Britain to financial ruin on the back of unwavering ideological belief in rolling back the state. Hardly think Cameron/Osborne are going to take advice from failed Socialist whose dreams of Euro are collapsing around him – if his best plan is Tobin tax designed to to disadvantage London inorder to protect his precious project then he is clearly just a fantasist.